Favicons are the little icon next to your domain name in your browser URL bar. 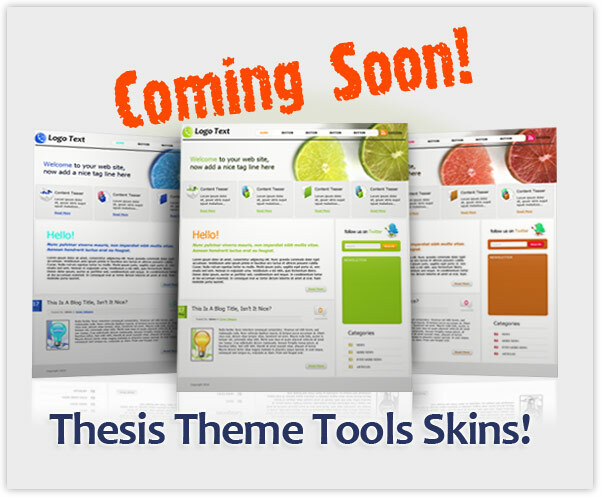 Take a look at the one for Thesis Theme Tools, which is the hammer in our header. A favicon of your own is a great way to make your site appear more professional and credible. Creating a favicon is easy, and a new article, “How to Create and Use a Favicon” shows you how to do it. It is fully illustrated and compares the results of two leading favicon generators. So, take 15 minutes and make your site look like you mean business and create a favicon! Breadcrumbs are used by many bloggers to show visitors where they are in the blog. It lists the file path from the home page to the current file, usually in a line of text between the header and the content. Previously, the only way for Thesis users to get breadcrumbs was to use the Yoast Breadcrumbs plugin. It does what it says, but like most plugins, is inflexible in its placement, and you can’t change fonts or make other customizations. The tutorial Easy Breadcrumbs Without a Plugin changes all of that. Besides handling parent-child relationships the right way, it is extremely configurable. Correctly shows the parent of a child page. Clickable links in the breadcrumbs to previous or parent pages. Has versions for breadcrumbs everywhere or everywhere but the front page. Works right out of the box with no settings or customizations. I’d be surprised if it took you more than 15 minutes to install Easy Breadcrumbs, including time to fire up your FTP program and text editor! The new version 1.6 of Thesis has some fantastic features, such as much greater control over fonts and colors, dropdown menus, and a host of other under-the-hood improvements. However, there is one big problem: Due to the many changes in how Thesis 1.6 uses the WordPress database, you cannot go back to a previous version of Thesis! This will scare the willies out of many and will prevent them from upgrading out of fear they will do something wrong. But help is here! I just published “Upgrading to Thesis 1.6“, a step-by-step guide to upgrading to Thesis 1.6. It has easy to understand instructions with lots of illustrations that will give you confidence that you can upgrade your Thesis installation quickly and safely. So there’s no reason to hold back — upgrade today!